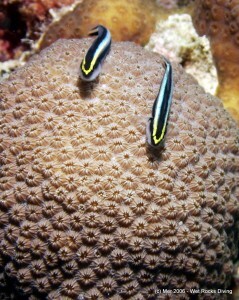 These pillars of the GUE-philosophy enable safe and fun diving adventures! These multiple pillars of the GUE philosophy translate into benefits for the diver. These benefits are personal. You should and will have your own reasons to select GUE (or not) as an organization you train with, identify with, and/or join. For Mer, the benefits of GUE means different things in her different rolls. As a diver, GUE gives Mer the ability to travel, tag up with the local GUE community, shake hands, and go diving, since we’re all on the same page diving to the same standards. GUE has given Mer the control and capacity to thoroughly appreciate diving’s graceful beauty and relaxation while enjoying excitement, shenanigans, friendship, and new challenges. As a student, Mer benefits from GUE being a small organization with quality, experienced instructors who are active divers who challenge themselves in their personal diving. The small size of the organization keeps quality and consistency high. GUE’s methods accelerate students’ learning processes by providing them a well-trodden path to rapidly increase capacity bypassing much time-consuming trial and error. These unique teaching methods aim at mastery, rather than a checkbox-mentality that can leave skill-sets thin. 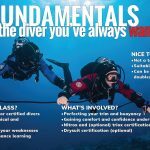 Focus on constant improvement to increase skill, comfort, confidence, and competence, and therefore the capacity that allows divers to focus on why we’re in the underwater world in the first place. Mer tries to return to “student mode” frequently and finds this is the best way to stay connected to her own students’ processes of learning and refine her own teaching skills. As a teacher, GUE provides Mer a truly progressive program to teach that breaks complex tasks and knowledge into small bits, which makes student learning easier, values practice time, and makes greater accomplishments possible. The GUE curriculum provides the flexibility to customize each dive and each class to student goals, interests, and skill-level allow us to make courses relevant to new and seasoned divers alike. An experienced instructor corps of active divers and explorers is always brainstorming and innovating to improve the program. Being one of the few diving organizations that freely publishes its Standards, providing students transparency with class expectations and policies. As a scientist, Mer used to study stars, from small “blinking” ones in our stellar neighborhood, to big fiery ones that are actually the center of young galaxies billions of light years away. At heart, Mer is a scientist. GUE provides the skill set and opportunities to be involved in exciting and productive research and exploration into our underwater world. From the opportunity to be involved on the front lines of a Project Baseline study site, collecting data underwater, to the skill sets, ethos, and methods to be an effective and crucial support diver in a larger research and exploration team such as for major missions of Project Baseline on R/V Baseline Explorer. For Mer, GUE fills that need to research and be part of the scientific method, to explore, and to challenge oneself while giving back to the larger community and world. Working to redefine the ties binding the average underwater enthusiast to underwater explorers, conservationists and scientific researchers GUE is committed to the overall goal of promoting the interests of the underwater world and of those who seek to engage it. GUE is a 501(c)(3) non-profit organization. Become a GUE Member today!